Tashkent, (DNA) – A delegation of the Uzbek Embassy in Pakistan led by Ambassador F. Sidikov visited the city of Faisalabad in the province of Punjab.During the visit, a meeting was held with the rector of the National Textile University (NTU) of Pakistan, T. Hussein, where the parties discussed issues related to the establishment of Uzbek-Pakistani scientific, technological and educational cooperation. Having got acquainted in detail with the scientific and technical potential and capabilities of our country, T. Hussein praised the achievements of Uzbekistan in all areas. Particular attention was paid to light industry. In particular, the source stressed that Pakistan recognized that the textile industry of our republic is advanced in Central Asia. The rector of the University also noted that Uzbek cotton yarn for spinning and weaving mills has always been very popular in Pakistan and around the world. “In this regard, the export of Uzbek raw cotton to Pakistan can be a promising direction of trade and economic partnership between our countries,” the rector of the NTU said. During the meeting, a presentation was held on the potential of our country’s textile industry and investment opportunities created in Uzbekistan. Of particular interest among those present were the Program for the Development of the Main Industries of the Textile Industry in 2018-2021, existing tax holidays, exemption from export payments, as well as benefits and preferences provided in our country for enterprises with foreign investments. Following the talks, the NTU leadership confirmed interest in establishing cooperation with Uzbekistan, and also invited Uzbek partners to participate in the upcoming Fourth International Textile Innovation Conference NTU DICE Textile Innovation Event, which will be held in Faisalabad on March 5-7, 2019. Then, in the Chamber of Commerce and Industry of Faisalabad, an extended meeting was held with the leadership and members of the Chamber of Commerce, the Association of Light Industry Factories, representatives of local business circles and the media. The Pakistani side expressed interest in importing Uzbek raw cotton, technical sulfur, cotton materials and raw silk, as well as organizing a visit of importing businessmen and investors from the Pakistani region to Tashkent. 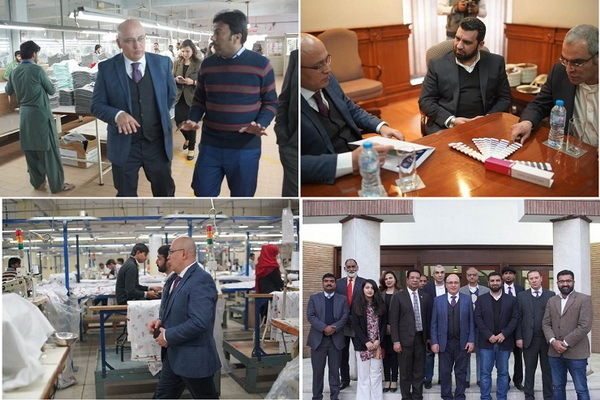 At the meeting, the leadership of the Chamber of Commerce and Industry of Faisalabad organized a visit to the production facilities of knitting factories Fashion & Trends and Trends Zarai Model Farming, which produce their products exclusively from imported cotton yarn. In order to attract foreign direct investment in the economy of Uzbekistan, as well as expand the export of Uzbek textile products, the Uzbek delegation met with the co-owners of the large Pakistani concern Crescent Group brothers Shafi. As the meeting participants noted, “Pakistan company began studying the export and investment potential of Uzbekistan, taking into account the consumer demand of the local market.” He declared interest in cooperation, as well as import from Uzbekistan of raw silk, cotton yarn and finished dyed yarn. Along with this, in order to expand the export of its products to the markets of the CIS and Baltic countries, the Pakistani company is ready to explore the possibility of opening a factory in Uzbekistan for the production of knitwear, primarily brand bedding. During the negotiations with the Shafi brothers, the Uzbek delegation organized visits to the company’s industrial sites and laboratories, as well as the “show-room” of the Crescent Group concern. Who is to benefit from Sri Lanka bombings?